World-rated featherweight Toka “T Nice” Kahn-Clary (24-1, 17 KOs) has graduated from prospect to world contender. 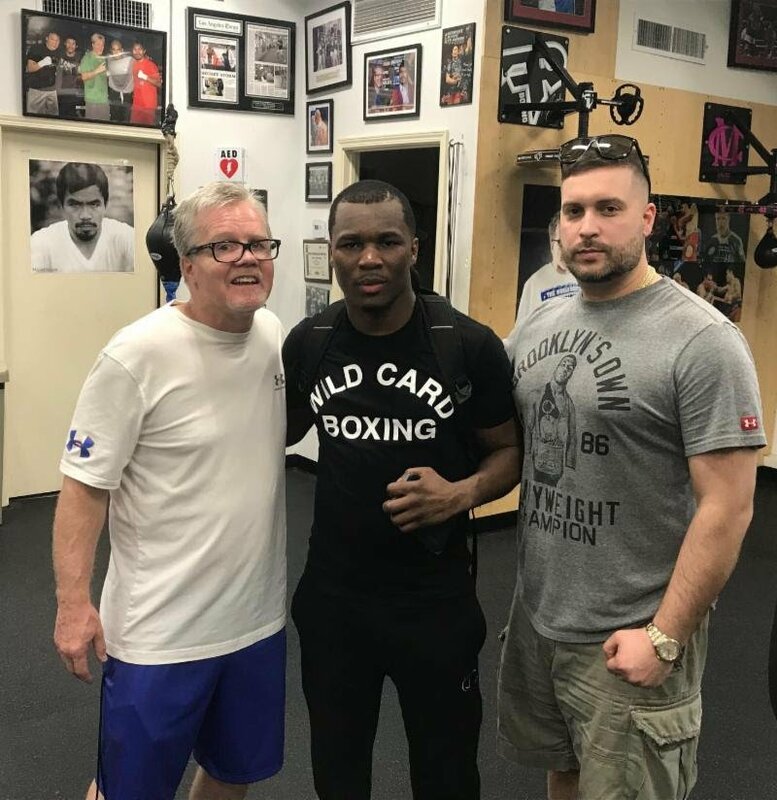 To fully develop, Kahn-Clary recently shifted his training camp from the smallest state in the country, Rhode Island, to the second-largest city in America, Los Angeles, where he has started working with Hall of Fame trainer Freddie Roach. Fighting out of Providence (RI), Kahn-Clary made the six-week move to Roach’s famed Wild Card Boxing Club to receive fine tuning from Roach, avoid any potential distractions at home, and have an opportunity for world-class sparring sessions. “Freddie is very precise,” Kahn-Clary reported after a few days with New England native Roach. “Sometimes I get a little lazy on the ropes. No, no, not with him. I wanted to prove right away that I listen. We were working on the pads and Freddie said, ‘You’re not as dumb as you look.’ I thought that was cool coming from him and took it as a compliment. He’s working on me being in total control in the ring. I’m not really going to learn anything too new from him, but it always helps to add a new move here and there. He saw that I’m fast and work the angles. He’s not changing my style, just sharpening my tools. Toka-Kahn’s remarkable life story started in his native Liberia, where he knew very little about his real mother as a child, or how many siblings he has in his family. When his father moved to the United States and in 1998, six-year-old Toka Kahn and his younger sister joined him there in Philadelphia. His father, though, was later shot to death, leaving Toka and his sister alone. In 2000, they moved to Providence (RI) to live with a family that, frankly, didn’t really care what happened to them. All signs led to him falling in with the wrong crowd and getting into serious trouble. He was homeless for a while but, fortunately, he found boxing and that became his salvation. Saved the day his friend first took him to Manfredo’s Gym in Pawtucket, RI, when boxing trainer Peter Manfredo, Sr., USA Boxing/New England president Jim Perella and the couple that eventually adopted him, Andrea Watson and Ron Clary, all became key parts of Toka’s dramatically changed life. No matter the weather, including snow and freezing conditions, Toka always rode his bike seven miles each way to the gym from his residence, which didn’t even have electricity. He never told anybody, never complained. One day, Andrea told the quiet, private kid in the gym that Christmas was coming, and she had a present for him – an extra bedroom. He was adopted and proudly changed his name to Toka Kahn-Clary. A decorated amateur boxer, who registered a 131-11 record, Kahn-Clary collected numerous medals at national tournaments, highlighted by a gold-medal performance at the 2010 U.S. National Golden Gloves Championships. He was also a silver medalist at the 2009 National Golden Gloves Championships and 2011 U.S. National Championships, as well as a bronze medalist at the 2012 U.S. Nationals Championships. Manfredo, Sr. remains involved in Toka’s career, working his corner with chief second Roach for his next fight, hopefully, June 2nd in Atlantic City (NJ) on his promoter’s (The Real Deal Boxing) proposed card. Kahn-Clary recently became a father for the first time, but he understands the sacrifice he’s making for his pro boxing career will payoff sooner rather than alter for his family. The 25-year-old Kahn-Clary is world rated by the International Boxing Federation (#11) and World Boxing Federation (#13). In his last two fights, Kahn-Clary defeated a pair of undefeated opponents, David Berna (13-0) by way of a second-round technical knockout in Louisville (KY for the interim North American Boxing Association (NABA) featherweight title, adding the NABA USNBC featherweight crown to his growing display case this past December, when John Vincent Moralde (19-0) was unable to continue after seven rounds of punishment in Providence.